I'm playing along with the Simon Says Stamp Wednesday Challenge Photo Inspiration. They post up a fabulous new challenge each Wednesday and the winner receives a $50 Simon Says gift voucher! 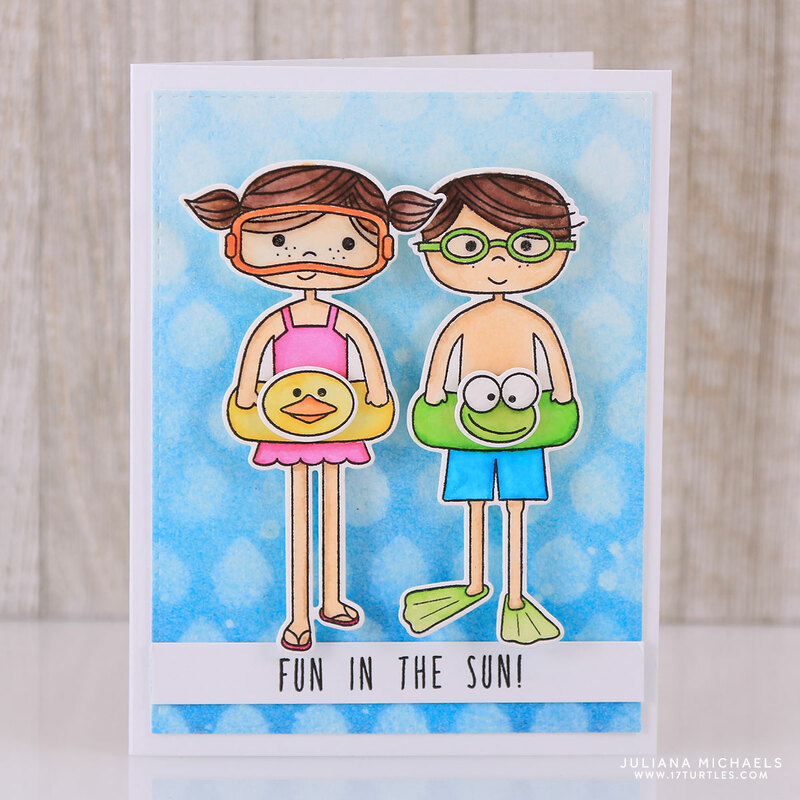 The inspiration photo screamed summer, beach and water to me, so I immediately pulled out my Simon Says Happy Swimmers stamp and die set and started playing. I began by stamping the swimmer girl and boy onto watercolor paper. I colored them with my Zig markers and then blended the color with water and a small paint brush. To give the adorable little swimmer's googles a more realistic look, I added some Glossy Accents. The really fun part though, was the creating the background. It took me a few tries to get the look I was going for, but I finally got it to work. I began with a piece of watercolor paper and used temporary adhesive to hold it in place on my craft mat. Using a Ranger Mini Round Ink Blending Tool, I applied various colors of blue Distress Ink to the paper. I started with the lightest color and then added progressively darker colors with more color applied at the bottom, than at the top, of the paper. I then placed a stencil over the top of the colored paper and used washi tape to hold it in place. I lightly spritzed a paper towel with water and then held the wet paper towel over the openings on the stencil to remove some of the ink. Make sure you don't use too much water or it will get under the stencil and remove too much ink. I then removed the stencil and splattered some water onto the background with a large paint brush. I gently removed the excess water with a paper towel. This step removes ink as well. Next, I applied clear embossing powder to the entire piece of paper and heat embossed it. Not all of the powder will end up sticking, but I love the effect it achieved. 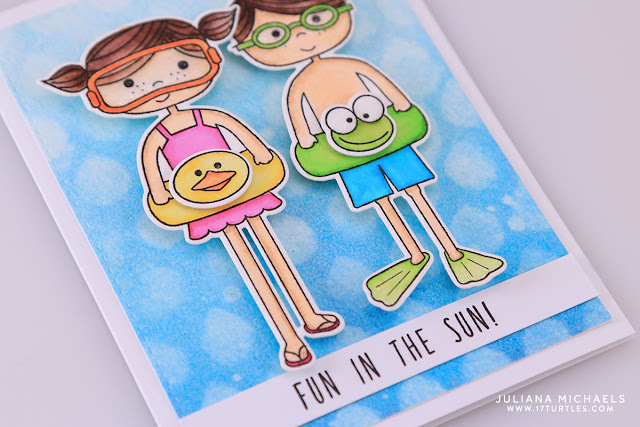 I thought it added a nice water like element to the background for my little swimmers. I had a blast playing along with this challenge. I just wish I had more time to play along with challenges like this. So what is your favorite challenge blog? Make sure you check out all the latest arrivals from Simon Says Stamp. 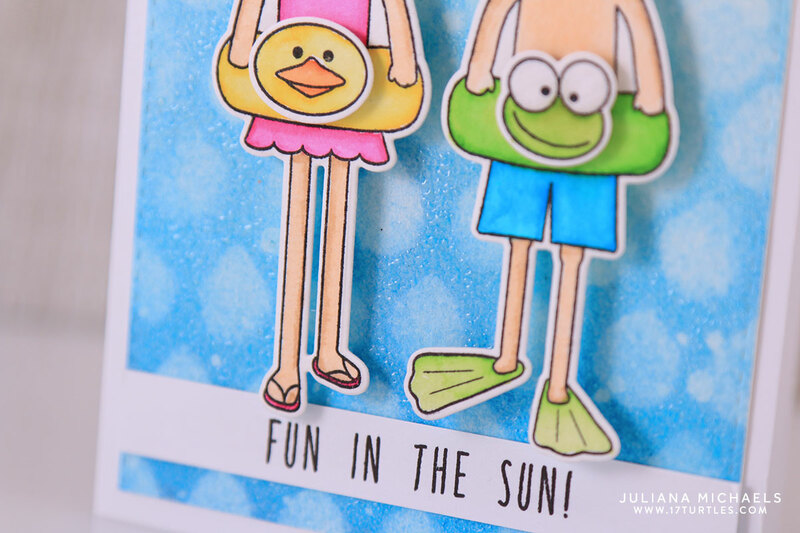 Fun In The Sun Card Supplies: Here is a list of some of the supplies I used on this card. Where available I use affiliate links on the products I purchase and use. This means that if you make a purchase after clicking, I will receive a small commission at no extra cost to you. Thanks so much for your support! THEY ARE so cute!! Juliana, great background! Very cute card! Love that background...neat to do more of that! Wonderful card Juliana! 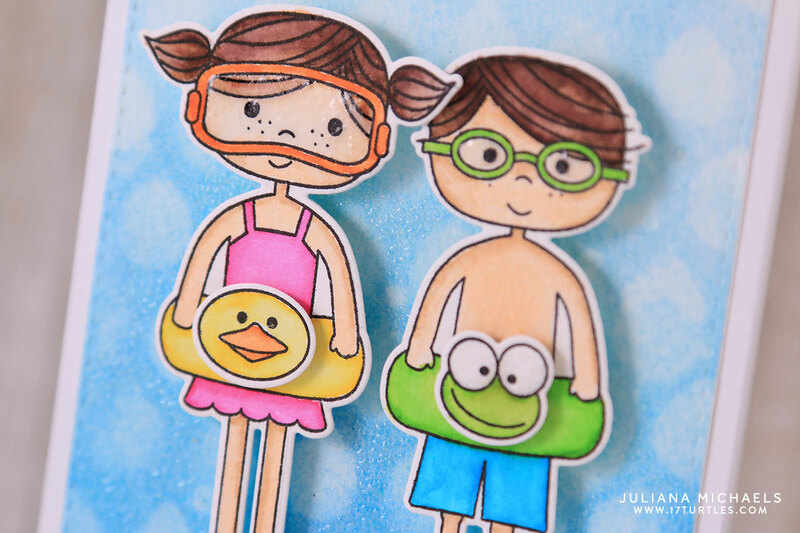 I love Simon's super cute Happy Swimmers and you've coloured them so beautifully.